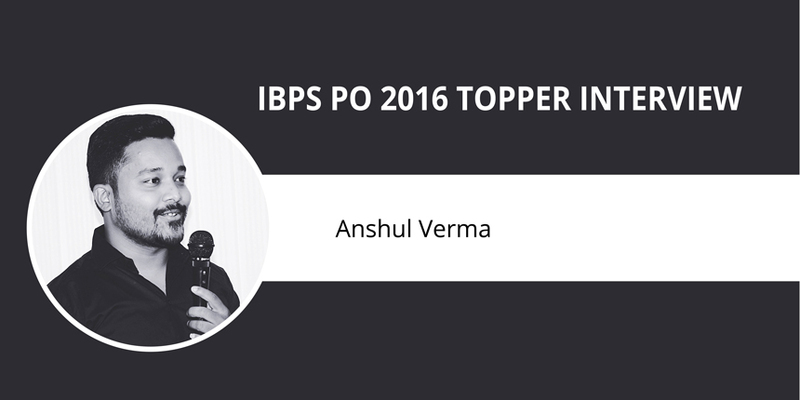 IBPS PO 2016 Topper Interview: Anshul Verma – A full-fledged preparation for a battle is one thing, whereas the execution in the battleground is all together different. What majorly determines victory or defeat in the war-field is the strategy used to execute your plan. This strategy of execution is advantageous in all fields of life, including any competitive exam. Anshul Verma, who cracked IBPS PO in 2016 followed these fundamentals only, to ensure his success in the recruitment exam. In a conversation with Craeers360, the IBPS PO topper shares in detail every aspect of preparation towards the exam. Though he believes that pure dedication, never giving up spirit, following your passion are the attributes one needs to have to see success in such competitive exams, it’s more important how wisely you attempt the paper to reap the best result. Anshul Verma: I did my schooling from Kendriya Vidyalaya, Jaipur and received my degree in Electrical Engineering from BIT MESRA. My father retired from PNB last year as Chief HRM Manager while my mother is a house wife. I have one elder sister who is a post graduate in Masters in Computers Applications and my brother-in-law is currently working as Section Officer in the Ministry of Finance, North Block. Careers360: What was your All India Rank, score/marks in IBPS PO? Which year did you qualify the exam? Where are you working currently? Anshul Verma: I managed to score around 71.05 marks out of 100 after normalization. I have qualified in 2016. I am currently working as Assistant Manager (PO) in Canara Bank. Careers360: What made you think that IBPS PO is the career you want to pursue? Which all other exams did you appear in and which all have you been able to crack? Why did you choose IBPS over other jobs? Anshul Verma: I feel, banking sector is one of the fastest growing sectors and that is what made me think about it seriously. In banking, we can have a variety of opportunities to grow further in future once we achieve a stable platform. The exams I have had qualified and was selected include SBI CLERK, BSNL JTO, ESIC UDC, SSC CHSL MAINS, and IBPS CLERK. I choose IBPS PO because it provided me to serve as an Officer in government bank through which I could render banking services to common man. Careers360: How much time did you prepare for IBPS PO? Did you crack it in the first attempt? Anshul Verma: I cracked this exam with a preparation of 1 year, in the first attempt. Anshul Verma: Apart from the other challenges, the major difficulty I faced the initial preparation phase where I was not able to understand the pattern. I was confused as to what to study and what to skip, about the resources, important books, etc. Anshul Verma: No, I did not take any coaching. I used to prepare from online resources by using various YouTube channels and many banking preparation websites. Careers360: How should one prepare for the examination? Tell us the strategy you had applied for preparing. Anshul Verma: Banking exams are all about tricky questions. You are tested not how much you know but also on your decision making ability. So, practice as much as you can and always choose questions wisely. Clear your concepts till class 10th properly with the help of some good books or online videos. Be well versed with square roots, formulas, percentage conversion, cube roots, tables etc. 6. Simple & Compound Interest. Quant is all about speed and accuracy. Solving lot of questions will automatically improve speed & accuracy. You can refer DI by Arun Sharma. Focus more on questions related to Alphanumeric Series, Coding & Decoding, Blood Relation, Distance & Direction, Statement & Course of Action, Argumentation, Puzzles and Seating Arrangement. Basic key to solve questions related to this section is to draw each and every possibility on the paper. Start analysing the diagram and the data. At the end you will find out that you are left with only one possibility which is the correct one. Try doing Venn Diagram technique for Syllogism. No need to refer any book. Just give as many mock tests and quizzes as possible. Start reading newspaper daily. When you are reading articles and editorials, you eventually develop the sense of correctness about the basic rules & principles of Grammar. You can refer book like “Plinth to Paramount” & “General English by S.P Bakshi”. It can be one of the most scoring sections. It comprises mainly of three sections: Current Awareness, Banking Awareness, Static GK. Keep checking about RBI news, Financial policies, Amendments, Mergers, Economics related news, Bills Passed recently etc. Similarly, for banking awareness check the basic banking terms. Careers360: In case of self study, how much is the probability of cracking the exam? What should be the preparation strategy for self study? Anshul Verma: First and foremost, just try to clear your concepts from online resources and practice online as much as you can. Careers360: Can you refer some good books with Author names for all the sections of PO exam? Along with the aforementioned books, make a habit to read a newspaper (I will recommend The Hindu) which will not only improve your vocabulary but also improve your reading speed subsequently. Careers360: While preparing for the Prelims and Mains, what different strategies should one make? Which part one needs to focus more on and why? 1) Start your paper with your strongest and favourite section which increases your speed so that your mind is composed for better accuracy. 2) Be selective in questions. Attempt only those which you can solve in that limited time. 3) Sectional switching is not allowed so keep in your mind subjects ranking in order to solve. 4) Don’t go for experiment in actual paper, sometimes our brain can’t keep calm in this situation and forces us to do the wrong things. Try to solve easy ones first like inequality, blood relations, ranking, direction sense, coding decoding, alphanumeric series after that jump to seating arrangement, puzzles and machine input output. First try to solve series missing, quadratic equation, then DI type, DI sufficiency and then miscellaneous topics. First try to solve cloze test, error detection, connection usage, double filler, antonym/synonym para jumble, rephrasing sentence to correct grammatical form and in last reading comp. Try to solve almost each question and maximise score in it. GK is the only one which makes sure your final selection. Please go through the last 3months GA and Banking Affairs. It will fetch you the highest marks. Any amount of preparation will not help you score if you have stress. Just be patient and keep a positive approach towards your exam strategy. Careers360: Any online test series you suggest for IBPS PO exam? Anshul Verma: Yes, OLIVEBOARD test series, as they are much updated as per the new exam pattern. Careers360: What are the growth opportunities and trajectory as a bank PO? Tell us about the salary structure too. A Probationary Officer in a Public Sector Bank gets a basic pay of Rs. 23,000 to Rs. 27,000. Various perks and benefits are also added to this basic pay and the overall salary finally amounts to Rs. 39,000 to Rs. 42,000. The salary of a candidate also depends on the place of posting and the bank he/she is selected for. All the candidates need to carry the documents in original and self-attested photocopies. Failure to carry any documents during the interview process can lead to debarment of the candidates. Careers360: What should one keep in mind while appearing in the interview? Anshul Verma: There are a lot of things that you need to keep in mind. Firstly, you have to make sure that you are prepared to answer questions regarding what is on your CV - for example, any projects, internships, and graduation topics. 9. Must know basic banking like FD, RD, difference between Saving and Current account, SLR, GDP, GNP, FDI, and FII or small payment bank, Banking Regulations Act, etc. The questions in the interview will revolve around specific questions related to Banking, Finance, RBI and Economic News, etc. Define BASEL III Norms or what is Jan Dhan Yojana? Banking Terminologies and Abbreviations - Examples: Types of account, Lockers, NPAs etc. RBI related news, terms, definitions, rules, and important facts - Examples: Repo rate, reverse repo rate, CRR, Name of governor etc. Basic graduation background and domicile place related questions. If you don’t know an answer, learn to say “No” in a polite manner. Be confident, analyse your strengths and weaknesses and try to express yourself with good communication. Anshul Verma: Keep practicing and analyzing your weak areas in order to improve them. Always stay updated from latest pattern of each and every banking exams. Keep an eye over all latest news around you for current affairs part. Do subscribe any mock tests in which you are comfortable with but do them daily. Keep yourself motivated throughout the journey as it is not going to be an easy one. All the very best to all the aspirants!